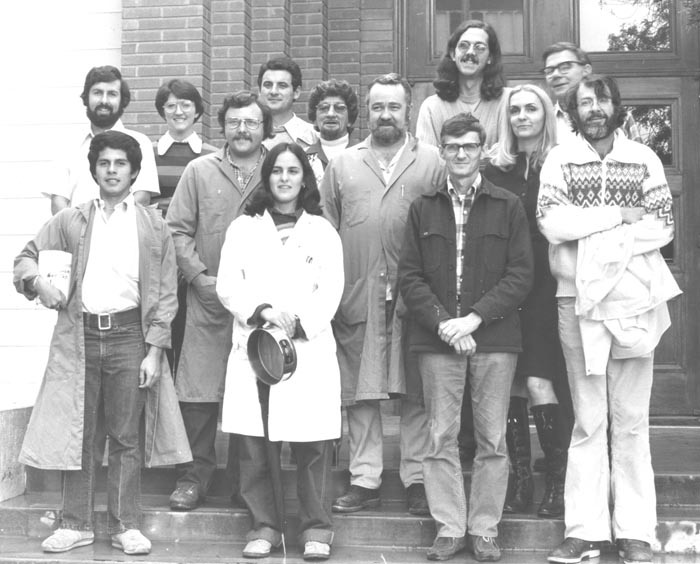 UCSB Geology Staff and Researchers, February 1977. Back row (l-r): Gil Williams, Joe McKee, Mike Queen, George Hughes, Frank Daniel, Dave Crouch; middle row (l-r): Mark Stein, Richard Hurst, Fran Cloud, Evelyn Gordon, Bill Bushnell, Meryl Wieder, Peter Garrett; front row (l-r): Bob Dunn, Wolfgang Todt, Emmy Hoffman, Anna Carter, Dave Pierce. 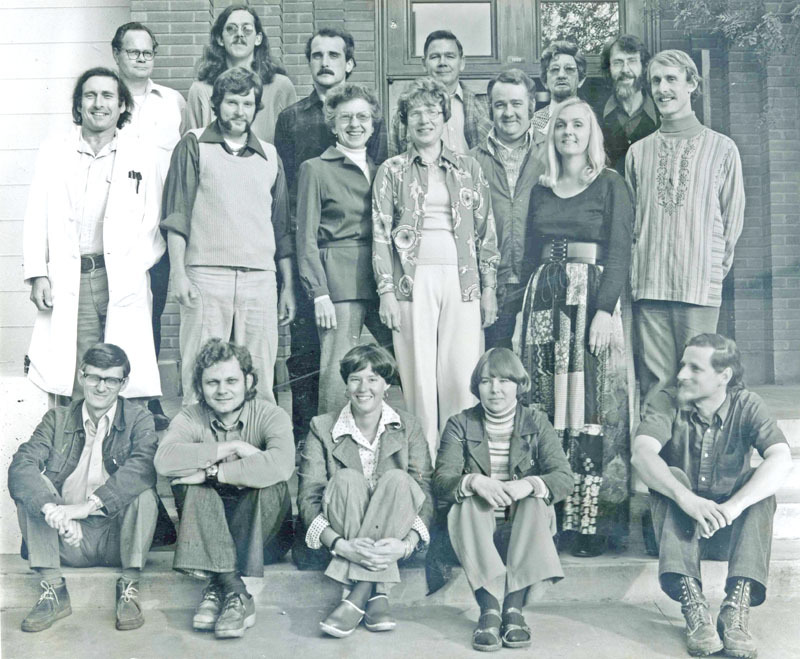 UCSB Geology Staff, January 1978. Back row (l-r): Craig Welsh, Joan Muhr, George Dunning, Jacques Revol, Frank Daniel, Bill Bushnell, Joe McKee, Meryl Wieder, George Hughes. Front row (l-r): Dave Bernal, Shari Videlock, Bob Dunn, Dave Crouch. 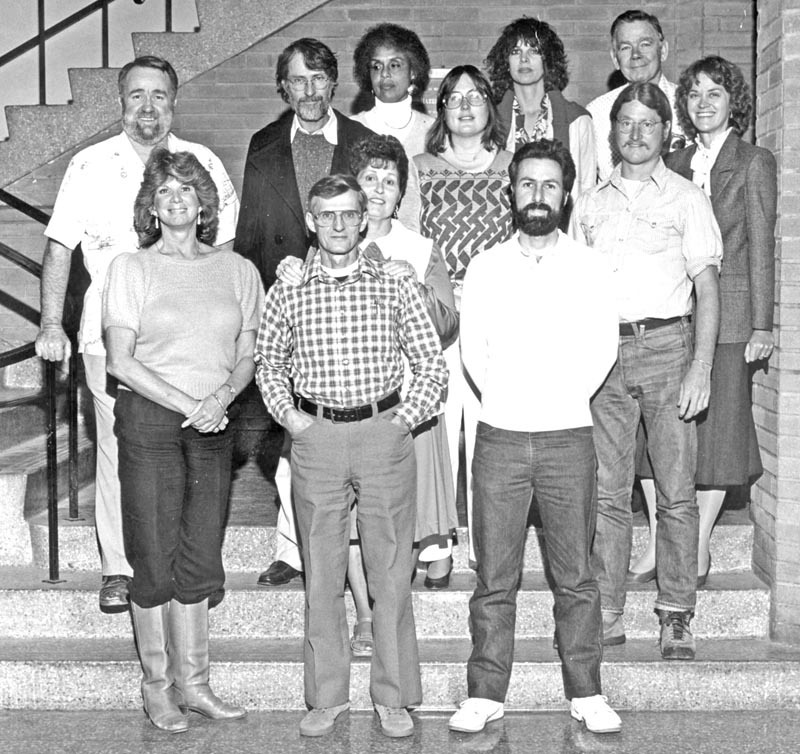 Geology Staff 1985, Front row (l-r): Patti Kelly, Bob Dunn with Ellie Dzuro, Craig Welsh, Second row (l-r): Bill Bushnell, Dave Crouch, unknown, Steve Sutter, Priscilla Mori, Back row (l-r): Pearl Lignon, Diane Mondragon, George Hughes.